I mean I am all over the place with the MANY people I deal with through my businesses and social media. I am very active on both Facebook and Twitter and some other sites. I comment and respond when people share things about what they are doing or what they are going through. But after a few weeks go by, I often forget things and I don’t mean to at all. Sometimes a person will connect with me and update me on something and I can’t even remember what or when they told me about it in the first place. The most frustrating part about me being so forgetful is with those who connect with me acting like they are my long lost friend and I have absolutely no clue who they are. I never let them know that I don’t know who they are and I am too embarrassed to ask them. LOL Has this ever happened to you? Well, I was communicating with this one person on Facebook for a few years now and did not know who they were. We have messaged back and forth and even IM’d a few times. I thought that the person may have been from my (brief) college days. I told my mom about it and told her the name and she actually knew who it was and reminded me. But the funny thing was that even after her filling me in, I still could not remember. I just really wish I could somehow organize PEOPLE. I wish I could have a filing cabinet in my brain that I could go to each time I have a meaningful connection with someone. I want to be able to think back on a conversation and KNOW the NAME of the person I was having the conversation with. It is not as much of a problem with those I speak with in person, because you can put a name with a face, but even that I struggle with at times. And my business is virtual, so a majority of the people I connect with on a daily basis are only through the computer and for some reason, emails, tweets, posts, and any other form of written words – they are just much harder for me to keep in order in my head. 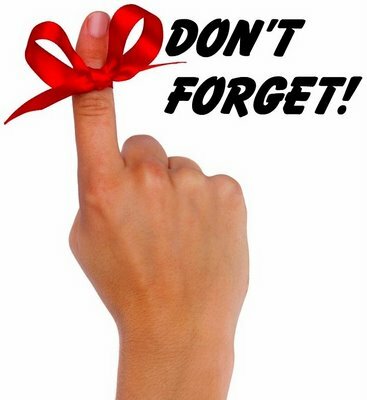 Do any of you struggle with forgetfulness? How do you deal with it? Any tips or tricks? One thing that I try to do, on Twitter at least, is to keep a column in my Tweetdeck just specifically for those people who take time to connect with me on a regular basis. I don’t want them to get lost in the shuffle of my 10,000 followers. I only have about 100 special people in that column, but it helps me to remember them. This happens to me ALL of the time. My memory started getting really bad after I had my second son and I couldn’t remember simple things. For instance, like why I went to the grocery store. Misplacing my keys is a huge thing for me because if I don’t put them in a certain place I won’t remember where they are and I will spend an hour looking for them. I have misplaced them in the freezer, the microwave, have left them in my front door overnight, in my car, under the baby in the car seat… The list could go on. I have found that making lists help me a lot although I’m starting to get bad at keeping up with them. (I would love it if you could share tips on how you make and organize your lists.) I make lists for everything. I really do. I have just basically come to the conclusion that the more children I have the more I loose pieces of my brain. lol I blame it on the babies. I don’t have any tips. I’m sorry, but I will be checking this post frequently to hopefully get tips from your readers. I have always been super-forgetful, even when I was little, even long before my college partying days. I can remember certain things, like I am good with numbers, but visuals kill me. For example, I have a REALLY hard time remembering what the waiter or waitress looks like. Now, I try to find something that stands out, like hair color, hair style, shirt, ets…but if the restaurant is staffed with uniformed waitresses who all have brunette pony tails, I’m in trouble! However, to combat that, I make an effort to make eye contact, start a conversation, and try to recall more about this server to mark them off in my head. For other items, I do a LOT. I have an upstairs and downstairs paper calendar, IN ADDITION TO my Outlook calendar, and popup reminders. I keep a “to do” list on my laptop as well as in paper form, at times. -overscheduling / overwhelm. If there’s too much to do, I will forget things. The key is to prioritize and not overschedule. For example, if it’s a heavy paperwork week (like, for school for kids), then lighten up on other commitments to get it all done. -preoccupation. As a writer, I often have my head in the clouds and am observant of things I’d like to write about. That means I’m less connected, so I’m making an effort to focus on the task / people in front of me, and not daydream. I carry a tablet with me everywhere. I will have a great idea for my business but if I don’t write it down, the thought train leaves the station and I don’t know when it will be coming back to the station! I actually keep a tablet next to the bed since things float into my head when I am laying there in the quiet. I am thinking about one of those brain teaser games that are suppose to improve your memory. I’ll let you know how that works out. Love that! (train leaves the station) LOL Love the notepad by the bed idea. I am always getting ideas when in bed and then totally forget them. Blog post titles are the big thing. I come up with the best ones and don’t write them down and then they are gone for good. Anyway, thanks for taking the time to comment Mary! Oh my goodness. I have the same problem with people. Gosh don’t put me in a room with 100 chinese people or something. I will have no clue who is who. LOL (And I say that out of love – no direspect towards other races or anything). I know one thing I could do more is utilize Microsoft Outlook. I am going to have to look for some good tutorials to help me get all it all figured out. I use it for email, but not much else. Anyway, thanks soooooo much for taking the time to comment on this post. Your info was awesome and MUCH appreciated. God bless ya! don’t feel bad, you’re not brain damaged. I have the same problem remembering people or stuff I supposedly did with people. One of my soririty sisters was telling me about a trip we took in college. I don’t remember taking this trip. How can someone forget an entire trip? I didn’t tell her that I had no recollection of the trip…i just faked it. You’re so funny! I totally relate. I try to keep a pad around for remembering things also but as far as people are concerned … that’s a toughie. 😉 Social media can be overwhelming in that way. The other night I was trying to remember the regular blogs I visit and was trying to figure out a system of fav’s but I’m so disorganized right now it’s insane. We’re going to be moving in a few weeks and I can only imagine the things I’ll be forgetting to do in those weeks. Aye carumba! LOL! 🙂 Have a great week! !